The picture shows two London Overground trains at Canonbury station. I have just alighted at the station on a train from Willesden Junction, that was going to Stratford along the North London Line and have crossed to the wide centre platform on the footbridge. The train on the right is going between Stratford and Richmond along the North London Line, in the opposite direction to my journey. The train has just called at the right hand face of this pair of platforms. The train approaching on the left, is an East London Line train going from Highbury and Islington station to East and South London. The frequency on the North London Line is about eight trains per hour between Stratford and Willesden and four trains per hour between Willesden and Richmond. On this section of the East London Line, the frequency is eight trains per hour. 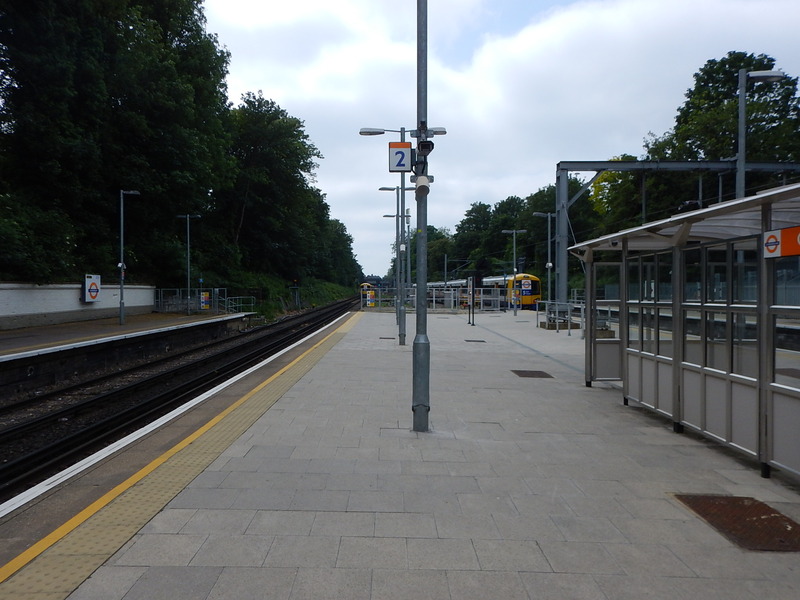 This means that if you are travelling either way along the North London Line and then want to travel on the East London Line, even if you just miss a connection, you have a maximum of about seven minutes to wait. To ease matters often a North London Line train will call at Canonbury at or just before an East London Line train arrives. Canonbury is a station with plenty of shelter and a coffee stall, so waiting isn’t the worst of experiences even on a day like today. The original layout of this station was more complicated and you didn’t need to change trains between Stratford and Dalston Junction, as you do now! But now, we design stations and track layouts, so that all passengers have an easy and fast journey. It doesn’t always please everybody, as the direct train a commuter has taken for years, might have been replaced with a faster service, that has a cross-platform change in the middle. Network Rail have published a report, where they may be reorganising the Cambridge and Peterborough to Ipswich services, by building a new platform at Newmarket. An hourly Cambridge to Ipswich service would meet an hourly Newmarket to Peterborough service at Newmarket, where passengers between Ipswich and Peterborough would walk across the platform to get the other train to continue their journey. We shall be seeing this type of train organisation a lot more in the future. But the passenger will get more and better services, whilst the train operator will be using the same number of trains. Canonbury was one of the first stations, where simple cross-platform interchange was built into the design. We shall see a lot more innovative station layouts.